I started to think about this dress at a friend’s 21st birthday party recently, as one of my main gifts from my fiance (now husband!) 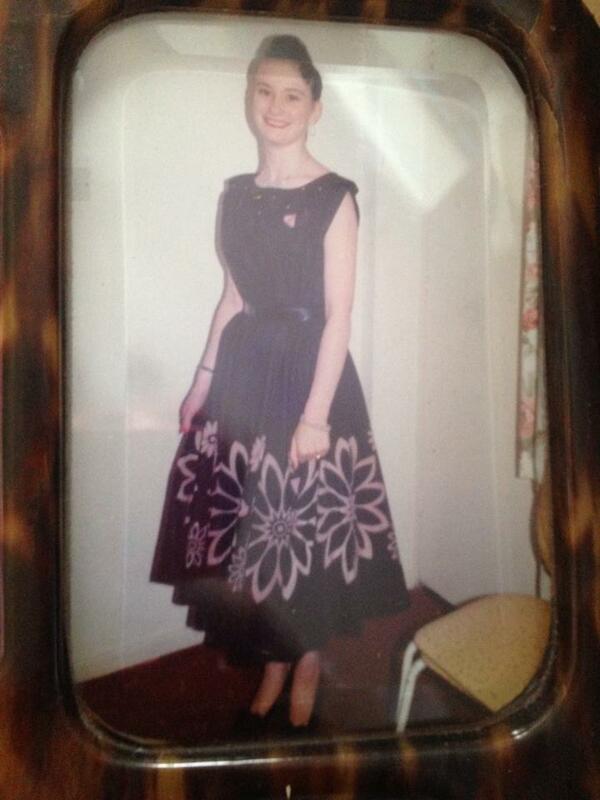 for my very own 21st in 1992 (I know, you didn’t think I was that old…) was this fabulous 1950s evening dress which I wore for the first time at my 21st party, and it has remained a favourite ever since when ‘dressing up’ for one reason or another is called for! Here’s a snapshot of said dress in the chalet at a Hemsby Rock ‘n’ Roll weekender which is a personal fave photo which is why it’s in a frame (excuse the reflection, I can’t get it out of the fragile vintage frame!) from the very early 1990s. 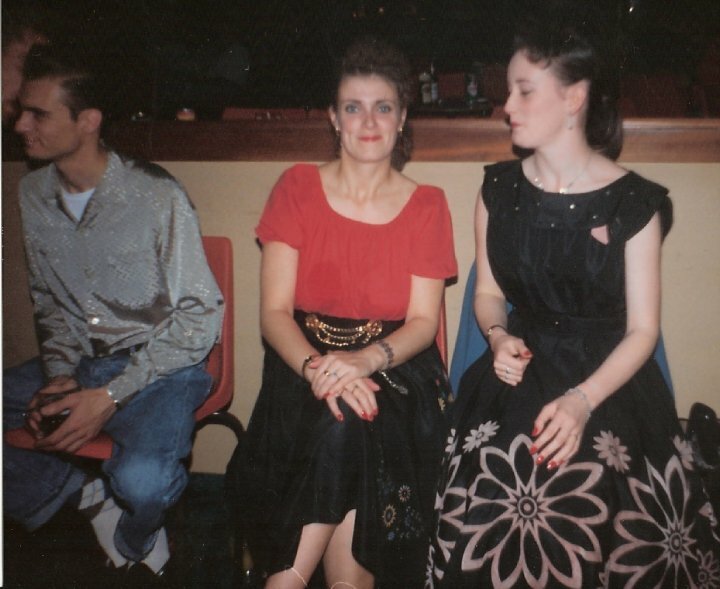 We also bought those yellow ’50s dining chairs at that weekender, and in fact I’m sitting on one of them now……The dress must have been very big on me at the time as I’ve worn it up until very recently & I have gained a fair amount of weight over the last 22 years! Back in those days I would just wear things regardless of how big they were, stick on a wide belt & you can get away with a lot! 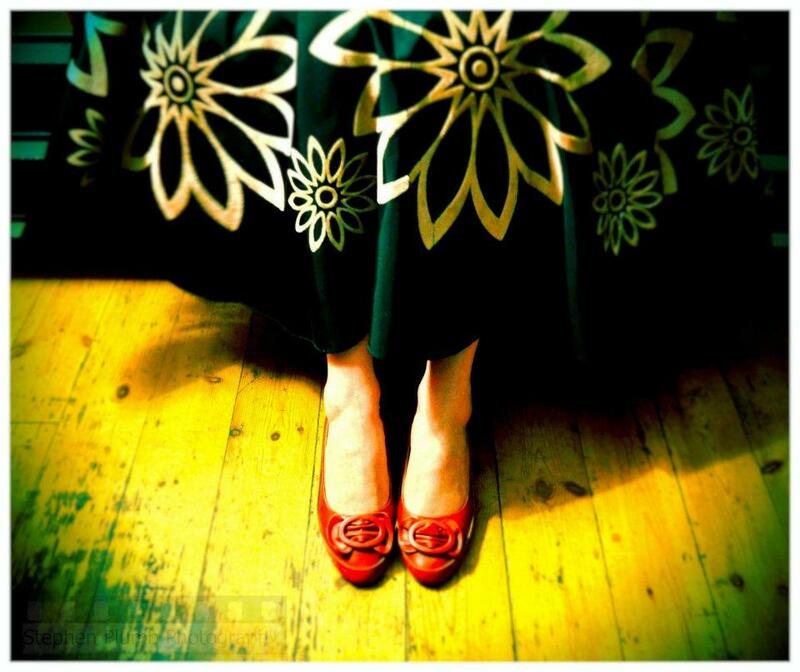 I had many skirts like that which I would gather at the waist with safety pins & then hold together with an elastic waspie belt, and then eventually they started to fit nicely without the safety pins and now, well I think you can guess how it ended…. The dress was bought from a couple of lovely ladies in Norwich who used to have a vintage clothing stall at a place called The Quayside Antiques Centre which we all loved going to (although I sadly can’t remember their names!) in the days when original 1950s clothes were more readily available & of course cheaper than today. I can’t remember how much it cost but I do recall it was expensive for the time (which is why it was a special gift) so probably more than £10! 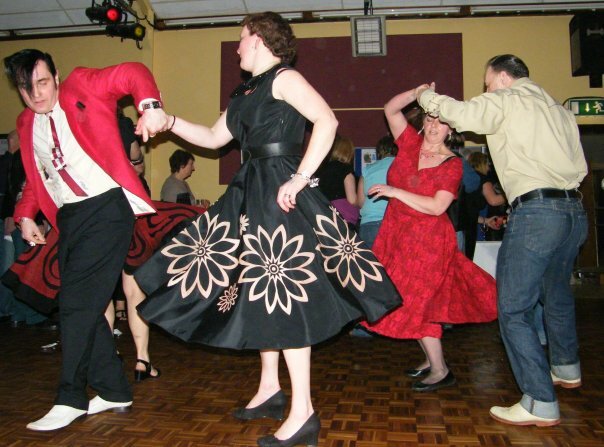 The dress is in a shiny fabric & the selling point for me was the fabulous skirt which is a complete circle with the salmon pink flower design in a kind of raised velvet. 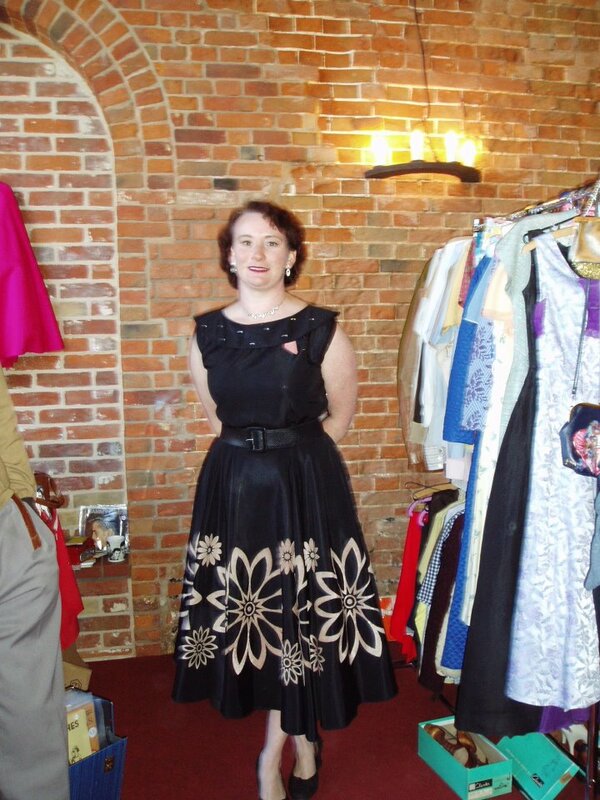 Because of the skirt being a circle & the fact that it doesn’t hang 100% evenly around the bottom (as lots of circle skirts don’t) I have always worn it with a black nylon & lace petticoat of several layers. The simple details on the top is great too – a small coordinating salmon pink feature & just a few sparkly bits to make it feel even more like an evening dress. Over the years it has usually been accompanied by sparkly jewellery, a black patent bucket-bag & black or sparkly high heels! 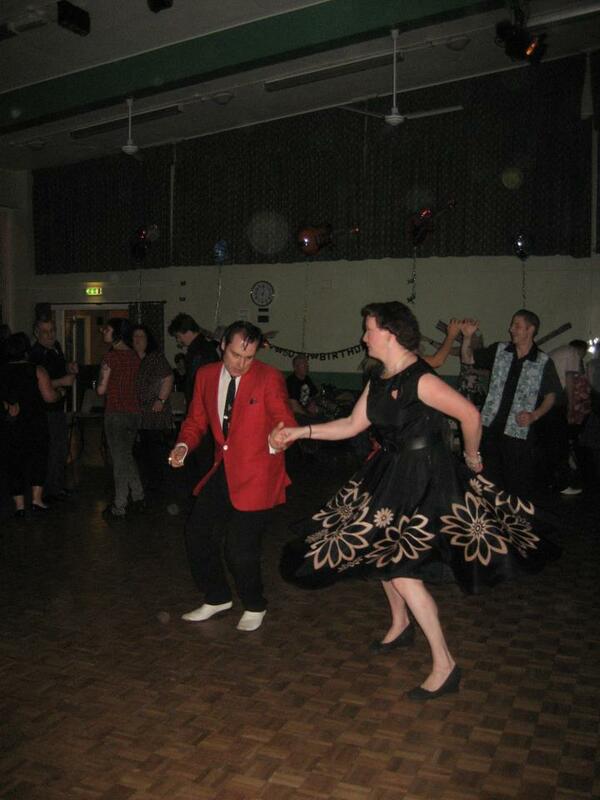 It is quite amazing again how well this dress has lasted – probably over 30 years old when I bought it and it has been worn continually by me for over 20 years, usually for dancing in and I have even stalled out in it at a vintage fair when it was Christmas & I wanted to dress up, with all the rigours that a day of vintage selling entails. 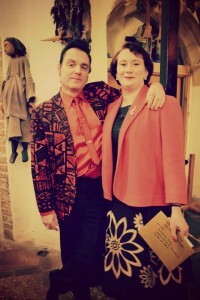 At the Christmas Little Vintage Lover Fair at Burnham Market in 2011. 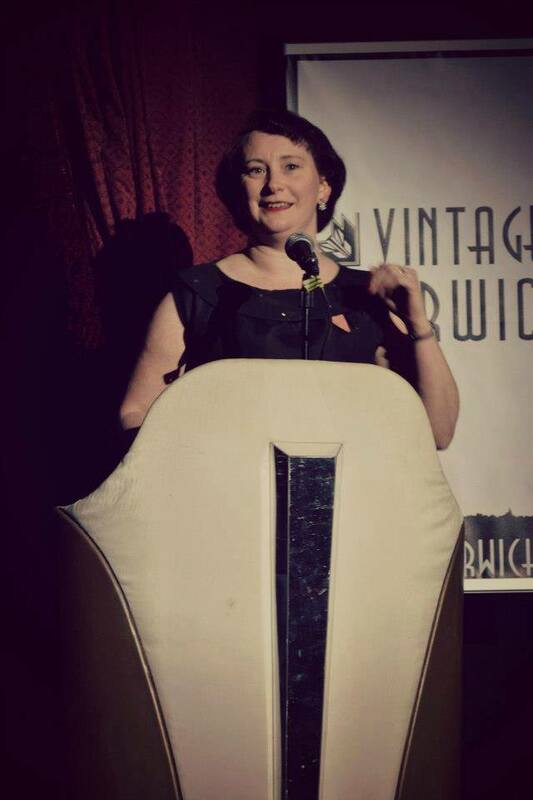 It has remained one of my go-to dresses of choice when ‘best’ is called for, so of course it got another outing when I was a sponsor at Retro Chick’s Vintage Norwich Awards in 2013 when I got to make a speech, present an award & everything.